Step 0 discussed how to install GCC and the make utility with the expectation of writing and compiling your first C program. In this article, I discuss how to use those tools we installed last time. Specifically, how to use GCC to compile a C program and how to write a makefile to automate the process. While there are many other tutorials out there covering roughly similar ground, I hope that you (a novice with some background in programming) find this tutorial to be more useful and approachable than other tutorials. In addition, my goal with this whole series is to teach the basics of a Unix-like development environment. I've found that the Unix approach to developing code produces efficient programmers with more autonomy and a broader understanding of all the various pieces that contribute to turning code into useful programs. If you've developed code before but never been able to break away from the chains of an IDE then this is the tutorial for you. Additionally, the development tools discussed here have been adapted to a wide variety of embedded systems. You can use some variant of GCC to compile code for a wide variety of processors: AVRs, MSP430s, ARMs of all sizes, PowerPC - you name it and there's probably a GCC compiler for it. Learning to use Unix-like development tools has direct applicability to developing code for embedded systems and will make you a fundamentally better programmer. Because it’s so simple, it’s easy to verify that it’s working correctly: if you see ‘Hello World!’ printed when you run it, you can be sure you did everything correctly. The steps to compile it are verbose at first, but they'll become second nature as you work more with code. (Note: these steps were written for Windows 7, but the same result can be achieved on nearly all versions of Windows with only minor changes to the steps). Save the the above source code into a file called helloWorld.c in the root of the C: drive using your favorite text editor. Afterwards, agree to the UAC dialog that pops up. It means you didn’t save your text file in the right place. 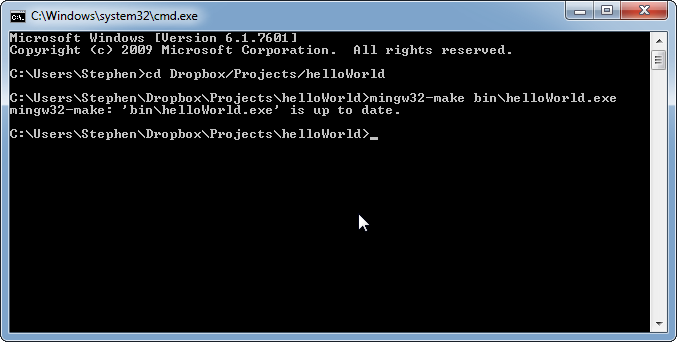 That ‘Hello World!’ means it worked - congratulations! Now programming is messy business. At this point you’ve got three files sitting in the root of your C: drive that weren’t there before. If the simplest C program imaginable leaves three files sitting around imagine the trash a more complex project will leave on your hard drive. Organization is key when coding, so I recommend picking a special directory to store all of your code projects, then giving each project its own directory underneath. I do this in my Dropbox so I can have quick access to all of my code across multiple computers. Each project directory gets its own organization scheme based on the one present in my article on project directory structure. src - All (one) of the source files are stored here. 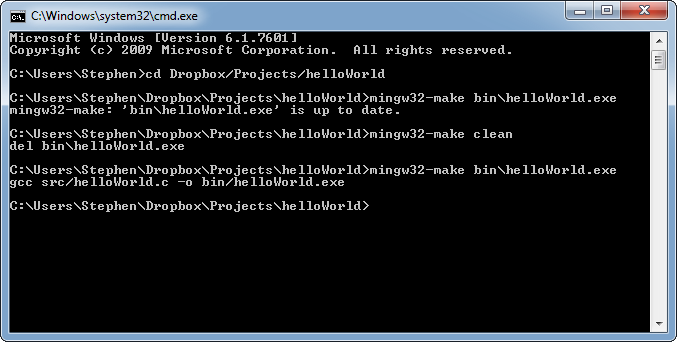 bin - The executable gets put here. You might have noticed that using the command line is a lot of typing - even for a simple C program. You might be wondering - are larger C programs simply impossible to work with? 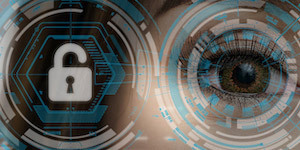 Basically, makefiles are a method of specifying 'recipes' for compiling source files into executables, object files, libraries and basically anything else you can think of. Makefiles automate the mundane and boring parts of compiling source files. They're actually a lot more versatile and complex than this, but for a programmer just starting off the primary thing a makefile will do is save you repetitive typing. ‘makefile’ has no extension - some text editors will try to put a .txt extension on it, so watch yourselves. The indent MUST be a tab character - not three or four spaces as some text editors use. If you don’t use a real tab character you’ll get an error when you try to use the file (as I’ll show you below). will both run the same command - the first time because the ‘all’ target is assumed and the second time because the ‘all’ target is explicitly specified on the command line. Any target name can replace the ‘all’ on the command line. Make isn’t just a glorified batch file - it has intelligence. One of the intelligent things that it does is track dependencies. 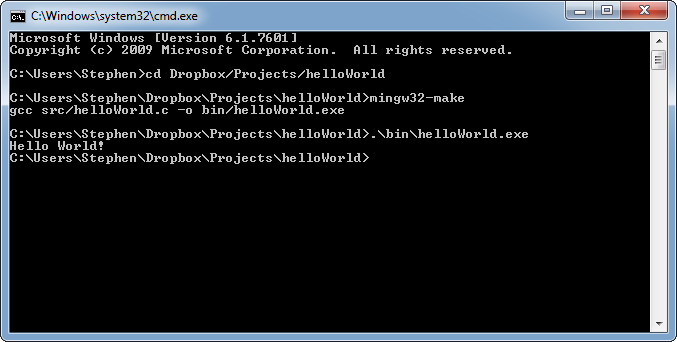 For example, helloWorld.exe is generated from helloWorld.c - helloWorld.exe is dependent on helloWorld.c. 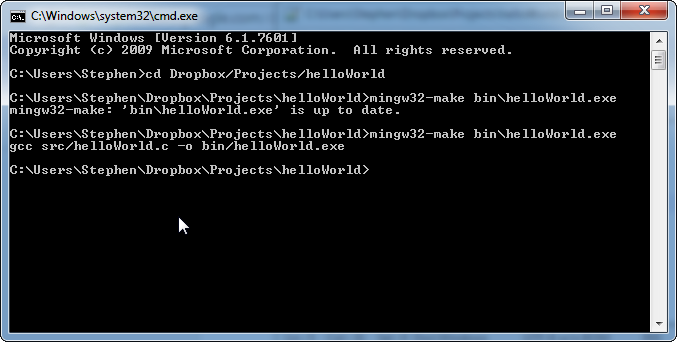 Make will never go to the trouble of rebuilding an output (in this case, helloWorld.exe) if none of the dependencies of helloWorld.exe have changed. If none of the dependencies have changed, the output is up to date (as the output of make told us) and recompiling the source file would produce the same output - so why do it? It might seem like this is a case of premature optimization and for this project, yes it is. But for a large project with hundreds or thousands of source files, only rebuilding the outputs that need to be rebuilt can easily save hours! 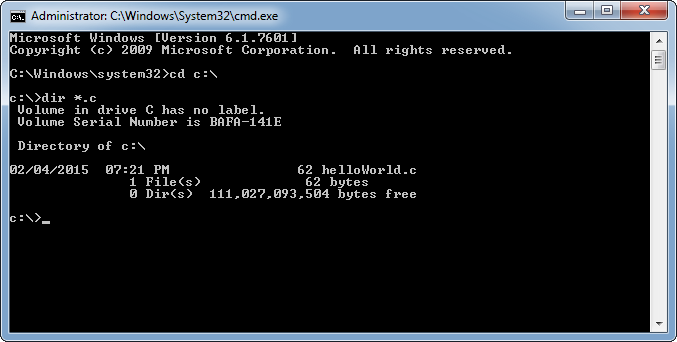 We’ve added ‘src\helloWorld.c’ to the right of the colon after the target name. By doing this, we’ve specified that the helloWorld.c file is a dependency of helloWorld.exe: the one is needed to make the other. You can have as many dependencies to the right of the colon as you want - just separate them by spaces. 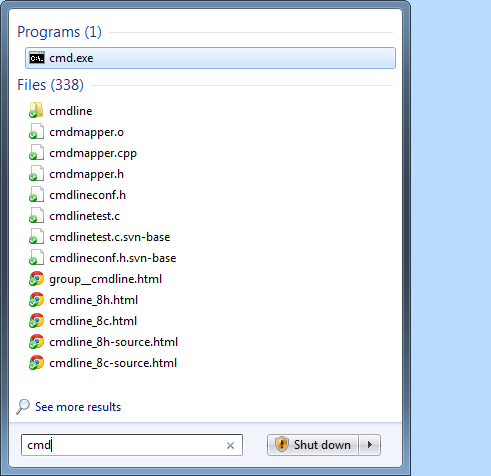 Dependencies can be other targets (such as ‘all’) or they can be files as is shown above. By adding this dependency, make will know when it has to rebuild helloWorld.exe and when it can avoid doing so to save time. Which is exactly the same as before. What gives? Now it will always rebuild helloWorld.exe every time you invoke it. This is an effective but not flexible solution. There’s an easy way to allow you to force a rebuild whenever you want without it happening all the time: the clean target. Works like a charm! Now you have the capability to force a rebuild any time. You’ll notice that I left the FORCE target in the makefile - it’s a common target that will most likely be useful to you in the future. Also, unused targets don’t really have any downside as long as they don’t make the makefile harder to read - certainly that isn’t the case yet. That’s a good amount of basic knowledge about compiling C files and writing makefiles: you can write a C file, compile it and write a makefile to handle all of those tasks for you. I’ve literally only scratched the surface of both of those topics - there’s plenty of fodder left for future articles. I don’t want to wear you out on a single topic for too long though - that’s why the next article will focus on basic source control with Git. your tutorial is so clear and very helpful. Many thanks! I downloaded and installed the GCC etc...; I went on with the step1 to compile the helloWorld.c program a popup window tells me that the "libiconv procedure entry point in missing in the libiconv-2.dll. Can you please tell me what it means .Could the libiconv-2.dll itself be corrupted? 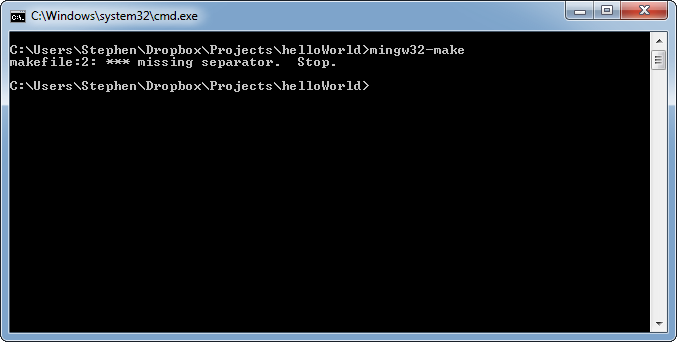 Yesterday I told you about a problem in libiconv-2.dll that would have prevented my helloWorld.c from compiling. Well,Good news! With the help of "DLL-Files Fixer" that file got fixed and I could compile the program which became helloWorld.exe. Now I'll try on with the Makefiles Chapter. I found (at least I guess so) a problem in your makefile.When the target is clean, I had to change the command to rm bin/helloWorld.exe, from del bin/helloWorld.exe to work. Yes I've had similar problems in the past. Your solution is one remedy that works - another might be to ignore errors on the 'del' command. Good catch! So, here is one thing I must say. First, let me get this out of the way. I use Windows system daily. 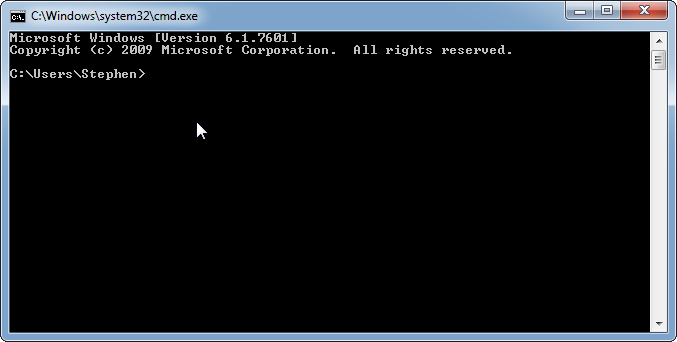 The system from which I am replying from now is a Windows 8 professional system. With the above said, I feel it is a waste of time developing software on a Windows PC. Instead, I feel is it much more productive spending time developing software on Linux ( or UNIX ) using GNU tools such as gcc, make, autotools, etc. Why ? Well because much of the embedded programming going on now days is done using Linux. Embedded Linux to be precise. Not only that, many of the very useful tools are available on Linux systems for free. Yes, yes, there are many tools which can be used on Windows as well. Then some of these are very easy to use, and perhaps are even free. But what do these tools really teach us ? How to do things specific for Microsoft platforms only ? Or do they really teach us about the lower level intricacies of that platform ? I would argue that they do not. Using various libc or POSIX api's on the other hand can and often do work cross platform, and offer a much broader insight as to how things really work. Or do we only really care about such things as WIN32_LEAN_AND_MEAN ?